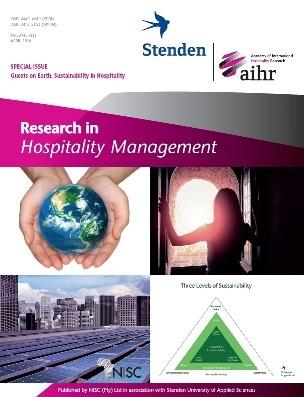 Research in Hospitality Management, Volume 6, Issue 1, 2016 is the first issue of Research in Hospitality Management to be published as open access, and it presents a special issue entirely dedicated to sustainability. Furthermore, the journal has now joined NISC’s ever growing list of titles that are co-published with Taylor & Francis. “The choice for open access has been dictated by the desire of the editorial team to reach a wider public and initiate the process of ranking of the journal.” Stenden Hotel Management School fully supports this strategic choice,” highlight Guest Editors’ of this special issue in the Editorial which can be viewed here. The special issue is designed to examine the relationship between sustainability and hospitality that has led to the development of the emerging field of Sustainable Hospitality Studies. In line with the editorial approach of Research in Hospitality Management, this special issue features both papers that explore current theoretical approaches, foundations of the critical issues in the study of sustainability in the hospitality industry and papers that address specific managerial challenges. Research in Hospitality Management (RHM) is a peer-reviewed journal publishing articles that make an original contribution to the understanding of hospitality and to the theory and practice of international hospitality management. Read more about the journal here.